Celebrating National Yoga Month, Akron Yoga Summit will be held Friday-Sunday Sept.25-27. 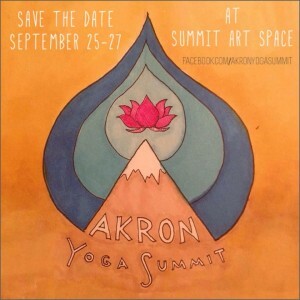 The Akron Yoga Summit will be the start of the 6th Annual Akron Peace Week! Friday will be in the Student Union Ballroom at the University of Akron. Lifesource Yoga Bodyworks professionals will be featured on Friday during the meet-and-great. Check the Akron Yoga Summit Facebook page for an up-to-date listing of classes and locations.